In this economy, we can't always afford everything to be NEW. 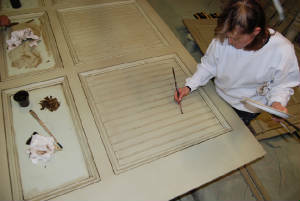 INSTEAD--revisit and accentuate what you already have with a unique finish of wood graining, glazing, and distressing. We service residential, industrial, and commercial clients in New Jersey and the greater Palm Beach Florida area. We are fully licensed and insured (License# L05000053417, U18553). Check out our TV debut!! In this home makeover on LXTV, Open House to the Rescue (part of the NBC family), the kitchen cabinets were done with Faux Iron by Fauxtasic Iron™ and finished by Cabinet Rehab/Fauxtastic Wall Finishes. View the still shots from the show on our Project Portfolio page. 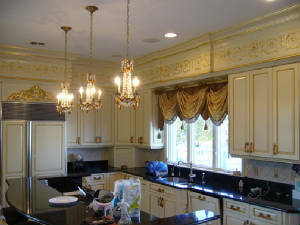 One way to give your kitchen a makeover is to have a professional sand and refinish cabinet doors and drawer fronts. 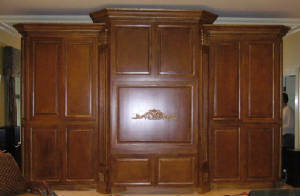 Refinishing projects take less time and cost less than complete cabinet replacements. Add a new look or restore your cabinets to their original charm with new brilliance. We offer a wide range of options in materials and styles to fit almost every budget. Diligent homeowners recognize that it takes more than routine maintenance to improve the value of their home. The kitchen is the most popular room in your home and can always benefit from improvements. Small kitchen projects show a great return on investment. If your family has outgrown your kitchen, or if the cabinets and appliances have lost their appeal, there are plenty of affordable ways to refresh your kitchen's look and functionality, such as rehabilitating your cabinets.